Starting a new year is always an exciting time. Many people look to make changes in habits by making New Year's resolutions. Research into human behavior suggests that if you make a New Year's resolution that you are much more likely to make improvements than someone who hasn't made a formal resolution. And, if you make it through the rest of January, you have a greater chance of maintaining those new habits and changes. 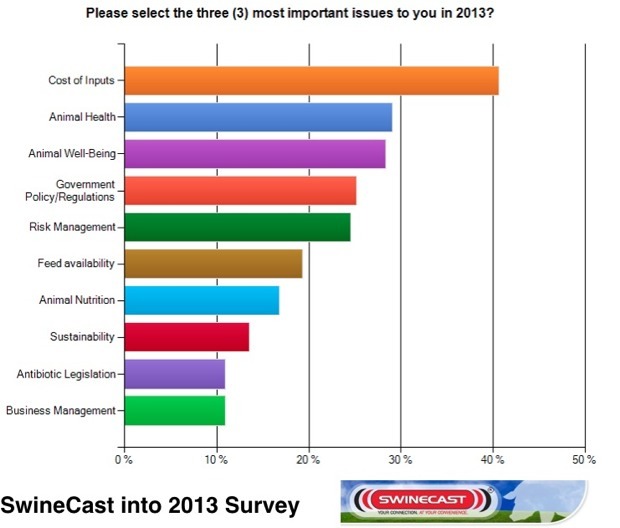 According to swine managers and production staff, the cost of inputs is the number one issue for 2013 (animal health and animal well-being are second and third, respectively). What does cost of inputs mean to you and what are you doing in 2013 to change your input costs? To help you make changes, we are sharing several of our top SwineCast presentations that offer some perspective on production, economics, and people. Have a great start to 2013! Audio: Are You Pushing Rope With No Pull? - Leadership without authority is a pig of a different color. If you can't hire and fire, how do you keep the team moving forward? General Stanley McChrystal found himself in just such an environment as he sought to meet his goals while working both within the U.S. military establishment and with outside contractors and civilians [audio] [additional presentation information from General McChrystal]. Video: How to Attract and Keep Valuable Farm Employees - Jim Lummus, Department of Producer and Industry Relations, National Pork Board, shares how to find people that are interested in pork production and are able to help your farm operations [video]. Video: Feeding for Pork Quality - Dr. Kenneth Prusa, Iowa State University, Department of Food Science and Human Nutrition, presents how feeding DDGs impacts pork quality. Dr. Prusa advises producers to consider the implications of ration decisions downstream and to understand the packers' concerns when it comes to pork quality for domestic and export markets [video]. Video: Improving Sow Lifetime Productivity - Dr. Laura Greiner, Innovative Swine Solutions, LLC, provides insight into productivity improvements for maximizing the reproductive performance of your sows [video]. Video: What is Your Daily Hog Chore Routine? - Dr. Mike Brumm, Brumm Swine Consultancy, Inc., aims to keep production and management processes simple and effective. In this presentations, Dr. Brumm reviews several standard chore routines and how, when those chores are done correctly, they can improve the bottom line [video]. Video: Don't Play Craps With Mortality - Dr. Sarah Probst-Miller, DVM, highlights how suckling pig diarrhea can be expensive and what steps production managers can take to reduce losses (and expenses) [video]. The Minnesota Pork Congress and the Iowa Pork Congress are in a few weeks. Both events offer an opportunity to meet up with friends and colleagues, discover what the economics of 2013 might look like, and to learn some new information to help improve your farm operations [registration: MN Pork and Iowa Pork].